My daughter, who is now 11, has had Fuzzy since she was an infant. She spent this past weekend with her Grandparents and brought him with her. My dogs “retrieved” him from her suitcase when she came home and proceeded to destroy the entire left half of his body. 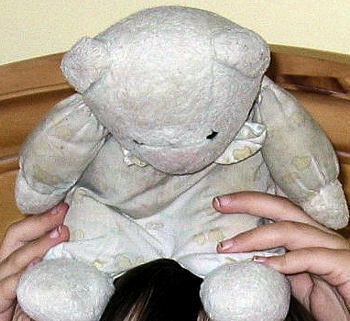 Fuzzy is a bear with a print on his sleeper that is little green/yellow ducks (much faded from much love). I had previously made him some “pajamas”, since the fabric is wearing thin. If possible, I would like to find a second one, so that I have a way to remake the pajamas, and then keep the new one as another friend.